Today, the same impulse that led our ancient ancestors to seek out what was beyond the next mountaintop animates governments, enterprises, entrepreneurs, scientists, and citizens to pursue frontiers beyond our planet. Relentless curiosity, the quest for resources, the desire for knowledge, and an instinctive drive to push outward toward new horizons all combine to inspire space activity. Alongside these, of course, are the motivations of the modern nation-state: competitive advantage, technological development, scientific understanding, economic growth, global prestige, and security enabled by command and control of the strategic environment offered by space. At the national level, space has always represented simultaneously a competitive and collaborative endeavor. Countries accrue tangible benefits from space activity—benefits that can set them apart from their peers. At the same time, space by its very nature reinforces the notion that people across separate societies are more united in their similarities than divided by their differences. Just as the Earth appears small when viewed against the enormity of outer space, human disputes can seem trivial alongside the promise of combined space exploration efforts. Accordingly, since the dawn of the space era, countries have sought to balance between unilateral and multilateral space activity, calibrating their approaches over the decades depending on both the larger geopolitical context and their own respective capabilities and limitations in resources, technology, and national will. Whether nations have conducted space activity together or separately, the effect on the everyday lives of people has been profound. Yet these uses of space services by individuals are the legacy of even greater, and ongoing, demands from governments, militaries, enterprises, and institutions: for launch vehicles capable of sending missions into orbit or beyond; spacecraft to connect globally dispersed populations, armies, and assets; systems to geo-locate people and equipment anywhere in the world; imagery of the Earth and its resources from above; and technology to serve a US$300 billion market. In the 21st century, space has been transformed from an object of wonder to an arena of geopolitical, economic and strategic consequence. To understand this arena, and the motivations informing the national and business actors operating within it, a structured framework is required. Leaders who seek to maximize their investments in space activity require a nuanced and rigorous analysis of its changing dynamics. 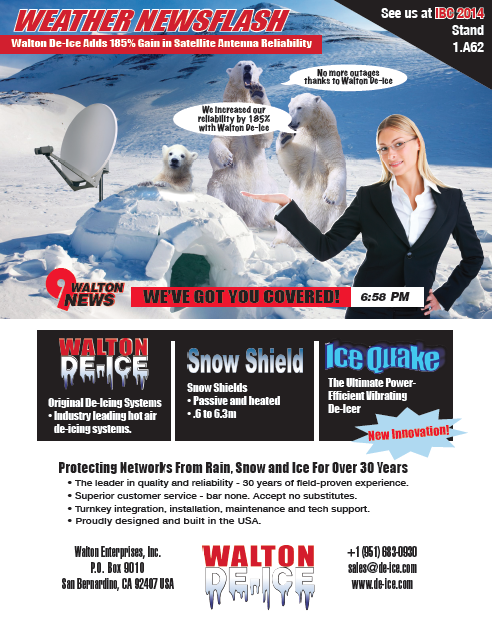 Futron Corporation, a premier provider of decision management solutions, created its annual, independent, and self-financed Space Competitiveness Index (SCI) for this express purpose. 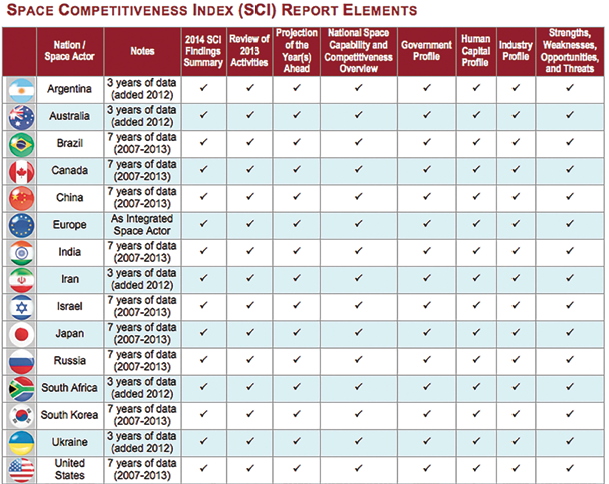 The Space Competitiveness Index is a decision management tool. It offers decision-makers an ongoing benchmark to continuously re-assess the competitive landscape of space activity—and to contemplate its meaning for their respective governments, enterprises, and institutions in an organized way. Now in its seventh year, the SCI methodology has been annually updated and refined. The accumulated seven years of data and analysis contained in this report offer salient insight into the strengths, weaknesses, trends, recent developments, and likely trajectories of 15 leading space-participant nations. Futron’s Space Competitiveness Index is a globally-focused analytic framework that defines, measures, and ranks national competitiveness in the development, implementation, and execution of space activity. By analyzing space-related government, human capital, and economic drivers, the SCI framework assesses the ability of a country to undertake space activity, and evaluates its performance relative to peer nations, as well as the global space arena. 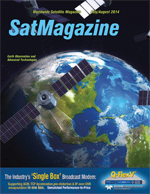 The SCI considers comparative space activities for 15 leading space actors, offering a comprehensive overview of their recent, current, and planned future activities, their national capabilities and competitiveness dynamics, their government, human capital, and industry attributes, and their relative strengths, weaknesses, opportunities, and threats. These nations are compared across some 50 individual qualitative and quantitative metrics, each collected for all 15 nations. These metrics are divided among three overarching competitiveness dimensions: government, human capital, and industry. Futron evaluates these indicators using a proprietary data model whose assumptions are annually reviewed and refined. The resulting scores form the foundation of the index itself, which is then interpreted through a written analysis featuring country-by-country profiles of national space activities and competitiveness dynamics. The integrated result is an annual report, published by Futron Corporation each year since 2008: Futron’s Space Competitiveness Index. Since Futron’s inaugural study in 2008, space globalization has only accelerated. Some countries with zero participation in space seven years ago now have space agencies; others with negligible space involvement have significantly increased the scope of their activities. Recognizing this change, in 2012, for the first time, Futron added five new emerging nations to its Space Competitiveness Index. These five nations are retained, and tracked alongside the original ten countries, in the 2014 SCI. One distinction of the SCI is its assessment of Europe as an integrated space actor. The activities that European countries undertake through individual space agencies such as ASI, CNES, and DLR are significant. Nonetheless, recognizing that the whole is more than the sum of its parts, Europe has chosen to pool national resources for a multilateral space approach through ESA. While the SCI considers European national activities, our analytic focus is on Europe as an integrated space actor. In 2014, Futron has reviewed its foundational 2008-2013 studies to provide a fresh perspective, surveying multi-year trends to enhance discussion of national dynamics. Futron’s 2014 SCI expands its country profiles, providing added data on space assets, infrastructure, budget, and commercial sector revenues. In addition, the 2014 SCI continues to use an optimized written analysis structure, designed to accommodate the interests of both casual readers and executive decision-makers. Global space activity drives a substantial economic engine, fosters national pride, and advances science and exploration. Some countries invest in space for the domestic esteem and international respect associated with independent technological and infrastructure capabilities. Others focus more on the benefits derived from satellite science, communications, imagery, and resource management. 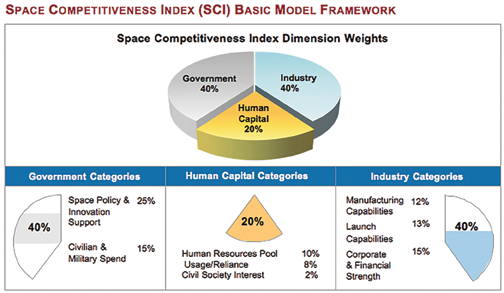 • What are the core elements of space competitiveness? Are they changing? And if so, how? • As space participation decentralizes from governments to companies and even to individuals and entrepreneurs, how will the nature of space activity evolve? • In this second decade of the 21st century, how will nations leverage both competitive and collaborative strategies to achieve or accelerate their space goals? • How does space competitiveness impact the broader socio-economics of nations and regions? • As the global economy recovers from the slowdown of the past few years, how has the focus of government and enterprise space plans evolved to keep pace with the changing environment? • How deeply has U.S. space competitiveness been impacted by the loss of its domestic human spaceflight capacity—and what will be its effects on the future of the U.S. space program? • What dynamics will shape the interplay among the three traditional, and current, leading space actors: the United States, Europe, and Russia? • How will China’s rapid achievement of space milestones shape its behavior in the coming decade? • As Japan builds on its Basic Space Law and subsequent reforms, will it convert positive administrative momentum into stronger mission tempos and deeper regional space leadership? • Will India’s new launch and spacecraft platforms finally expand its commercial market share? • Will Canada sustain increased levels of space funding tied to the RCM, or revert to lower levels? • How smoothly will South Korea transition from the recent success of its KSLV rocket to its next set of very ambitious space goals, including the landing of a rover on the Moon by 2020? • Will Israel’s new higher civil space budgets provide sufficient underpinning for its entrepreneurial startup sector and established prime contractors to expand their international market presence? • As Australia transitions from intensive space policy formulation to more gradual implementation, will slower momentum and political distraction reduce its tempo of space development? • As its international profile rises, will Brazil follow through on its Alcântara plans—even as its two launch partners, Russia and Ukraine, are distracted by geopolitical conflict with each other? • Will Argentina leverage its commercial satellite manufacturing niche toward a more global role? • How can Ukraine use its space industrial base to gain first-mover advantage in emerging markets? • How can Iran collaborate with other nations in civil space while assuaging military space fears? • Will the South African private sector assume a larger role in the country’s new space investments? • How will the geopolitical crisis between Russia and Ukraine affect the space competitiveness of both countries? How will it affect Brazil and other partner nations? And how will it affect the global launch and satellite manufacturing supply chain? To offer perspective on such questions, Futron Corporation has provided this 2014 update of its Space Competitiveness Index. Some top-level findings of the SCI follow. Argentina continues to adapt its satellite manufacturing sector for the international marketplace, exploring both commercial and government-to-government deals. It stands to benefit from increased investment in spacecraft subcomponents. Australia’s space re-emergence continues, with the government reviewing national policy segment-by-segment, focusing on the uses of space to Australian society—although momentum may be stalling as Australia pivots from policy formulation to implementation. The Australian private sector is assuming a larger role, including non-traditional entrepreneurial startups. Brazil is re-examining its national space priorities, but also reducing its civil space funding. As the global spotlight falls on Brazil in 2014 and 2016, its next space steps are a wide open question. Canada has experienced a small bounce in its space competitiveness, and retains a skilled space workforce, but ongoing implementation challenges threaten to offset these advantages. China trailed the United States in orbital launches in 2013 for the first time in two years, yet continues to far outpace other emerging in the speed with which it achieves new space milestones. Yet its commercial space role lags behind, and is beginning to reduce its competitiveness. Europe’s governance approach is organized enough to mobilize competing national priorities into collective action, yet flexible enough to fluidly accommodate new member states. How well it mediates the fateful question of Europe’s next-generation launch vehicle will be an important test. India has raised its game, developing fully indigenous launch vehicles and a mission to Mars. Iran has made faster progress than any new space participant since the Cold War, but fairly or unfairly, questions about the tenor of its program—civilian or military— impede collaboration. Israel has finally implemented civil space funding increases and published new policies, but lack of industry scale continues to limit its commercial space presence, despite a vibrant startup sector. Japan continues to improve thanks to its thorough space policy reforms, and has enjoyed recent commercial progress. Its ability to increase its launch and mission frequency and assertively market its commercial benefits are important to its future competitiveness and regional leadership. Russia has surged, largely restoring its launch success rate, remaining vital to ISS resupply, weighing long-term independent space station plans, and developing its new Vostochny Cosmodrome. Yet its annexation of Crimea strains its relationships, and may stall its resurgence. South Africa continues to develop its space policy and human capital base, but its technology and industrial base remain negligible despite the important Square Kilometer Array (SKA) project. South Korea’s KSLV success has helped bolster its credibility. The key now is to ensure this success does not go unnoticed, but instead build upon it to pursue commercial space goals. Ukraine has advanced in competitiveness even while suffering turmoil domestically. Yet it struggles to commercialize its space industrial base, and overlooks key emerging markets. International collaboration is increasingly taking shape as a concerted competitiveness strategy. Four distinct space competitiveness tiers have emerged. The first tier of traditional space leaders is dynamic, but relatively stable. The second tier of Asian space powers is intensely competitive: each country could plausibly surpass its near-peers within a short period of time. The third and fourth tiers are highly diversified: nations with disparate activities can attain similar scores, but for different reasons. And throughout, small gaps in score results can lead to large gaps in rankings. A critical benefit of the SCI is the ability to track competitiveness trends over time, supported by statistical analysis. Since introducing the SCI in 2008, Futron has identified notable movements among leading space-participant nations, now supported by seven years of tracking data, which are detailed in the 2014 edition of the report. For instance, of the 15 countries analyzed, only the United States has shown seven straight years of competitiveness declines. By contrast, China, Japan, Russia, and India have improved their own space competitiveness by 35%, 44%, 20%, and 16%, respectively, over their own relative starting points from when Futron’s benchmarking process began in 2008. The SCI also allows direct comparisons between individual nations. 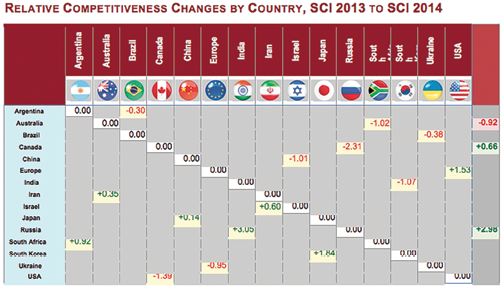 The table below offers a preview of relative competitiveness changes. Positive scores (in green) indicate competitiveness gains, while negative scores (in red) indicate competitiveness losses. For instance, Japan gained 0.14 basis points in overall space competitiveness relative to China, while Canada lost 2.31 basis points against Russia. In addition to providing a framework for analyzing current space competitiveness, Futron’s 2014 Space Competitiveness Index equips decision makers with the ability to review trends over time. To provide background and context, Futron has analyzed the past decade of space activity, based in part on spacecraft manufacturing and orbital launch activity among the 15 nations assessed in the SCI. The results are shown on the following page. Additional historic data and discussion are included in the full report. Although data analysis from the past decade can show us where we have been, the real question is: where are we going? • An Introduction offering insight into the SCI concept, purpose, methodology, and structure, as well as overarching themes driving the evolving discourse regarding space competitiveness. • Newly added in 2014, the introduction features a longer discussion of emerging countries besides those assessed in the 2014 SCI. Futron briefly speculates on which countries could constitute “The Next 15,” and includes highly abbreviated mini-profiles of four Southeast Asian space-participant nations—reflecting a region whose space activity has increased notably in the past few years. 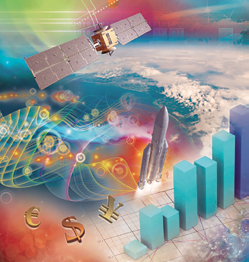 • Added data on national space assets, infrastructure, budget, and commercial sector revenues. In addition, the extensive full data set used to produce the 2014 SCI, featuring more than 60 spreadsheets of supporting metric information, is also available. For further details, please visit the Futron website at http://www.futron.com.